Lab Q&A: BG MOA® vs. BG RF-7 – BG Products, Inc. Question: When to use BG MOA® vs. BG RF-7? Answer: BG MOA,® PN 110, and BG RF-7, PN 107, are both intended to improve conditions of the engine oil. However, BG MOA® is a maintenance product, whereas BG RF-7 is more of a fix-it product. BG MOA® is an advanced ashless, anti-wear oil additive that provides enhanced protection to the engine. BG MOA® also provides for a high level of oxidation prevention plus detergency boost. Detergency is necessary to fight acid byproduct formed in the crankcase and provide ring land cleanliness. BG MOA® does NOT change the viscosity grade of the original engine oil. 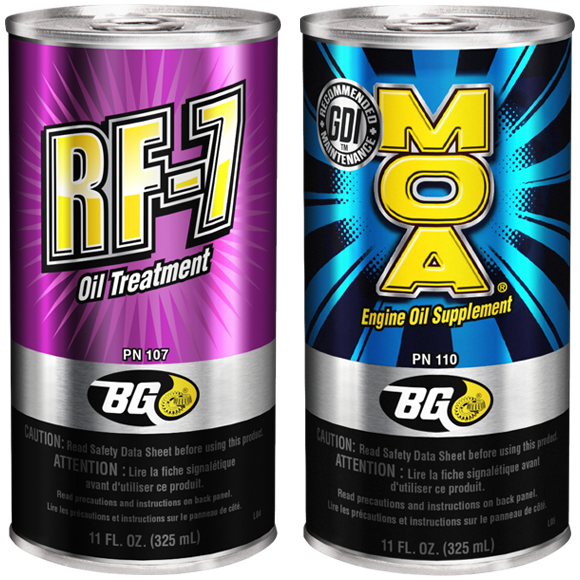 BG RF-7, however, is formulated to correct a problem within an engine. In older engines, where ring land sealing is poor or cylinder wall areas are worn, BG RF-7 helps build up the viscosity character of the engine oil under hot conditions so it doesn’t thin out and seep past the rings. BG RF-7 forms a cushion that reduces oil loss, increases or holds compression, and protects the cylinder wall from further wear. BG RF-7 also contains a seal conditioner to keep seals soft and pliable. Its primary purpose is to increase and improve the way the oil functions under high heat so it does not thin out. So to clearly answer the question above, BG MOA® is a maintenance product to be used regularly to prevent wear and protect the oil between oil change intervals. BG RF-7 is to be used only to maintain engine performance in a safe and cost effective manner in place of a repair cost that is worth more than the value of the vehicle.